Corina Gutierrez was fed up with getting sick and feeling weak. Then, she heard about Zumba. “Zumba transcends fitness because it’s not a boring old routine…you do over and over again. No, it’s a PAR-tay!” she laughed. And what do you do with a party? Share it! 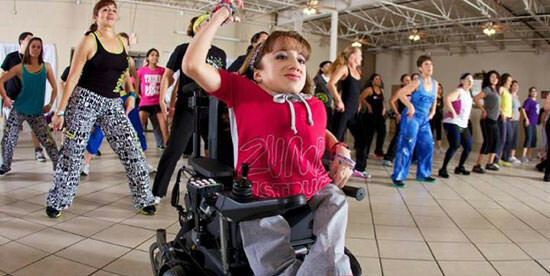 Corina was so impressed with her experience and with the physical and psychological benefits that she became determined to bring Zumba to other people with disabilities. Now Corina teaches Zumba primarily at the Enrique Barrera Community Center in San Antonio. Her 25 to 35 students are both ambulatory and in wheelchairs. 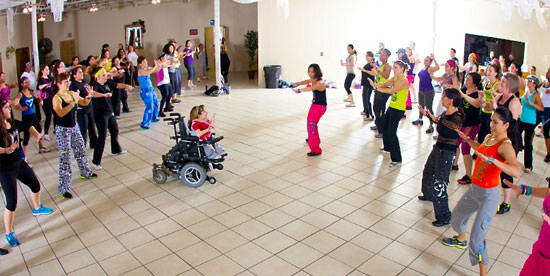 The adapted version of Zumba incorporates a lot of hand movements and rolling “steps” with one’s wheelchair. And with moves derived from Latin dances like salsa, merengue and the cha cha, it really does feel more like a party than a workout. Corina also has a helper to demonstrate the foot motions to standing members of the class. Corina teaches Mondays and Wednesdays, 7:00-8:00 pm at the Enrique Barrera Community Center, 5800 Old Hwy West in San Antonio, Texas. The drop-in fee is $5. Visit her website at http://corinag.zumba.com. You can also find her on Facebook or email her at CorinaG007@gmail.com.